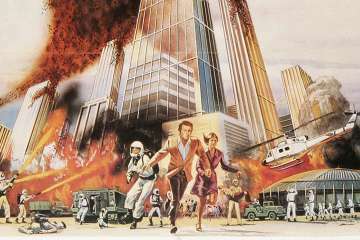 Starring: Richard Jaeckel, Ron Slinker, Lloyd Bochner, Joie Chitwood, John Agar, Ted Vollrath, Rance Howard, Courtney Brown, Joan Murphy, Luke Halpin, Suhaila, Billy Blue River, Templeton Fox, Jack Belt, Beverly Shade. 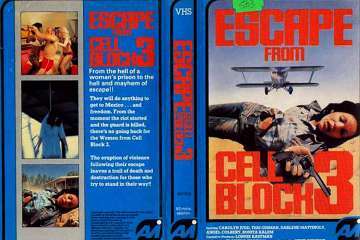 I first spotted this movie on the top shelf at my local video shop back in the early 80s and quickly grabbed the case, only to be told that somebody had nicked the actual video itself so I couldn’t take it out on rental! Two decades later a friend (who may have been the guy who nicked it, for all I know) lent me a copy. Was it worth the wait? Ask Godot. What we have here is what Ironside could have been like if Raymond Burr had been a badass motherfudger who had double-barrelled shotguns fixed to each arm of his wheelchair. 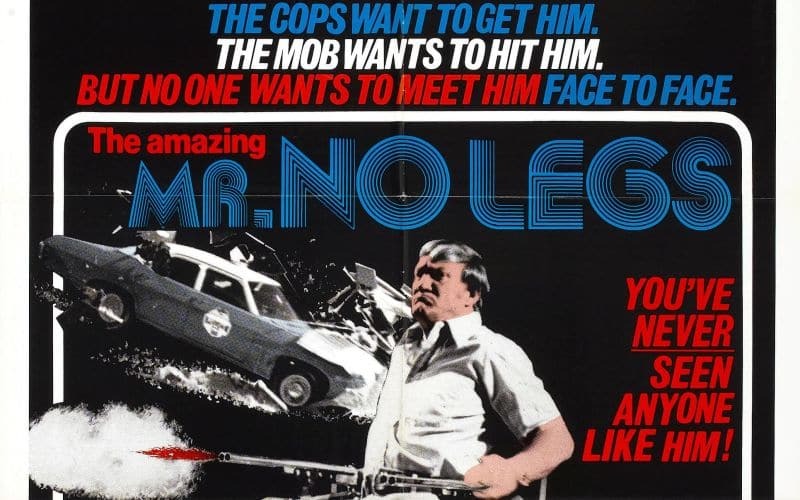 Shot in Florida by people who should have been shot in Florida, it’s about a gang of drug smugglers whose main enforcer is the ruthless Mr. No Legs, so called not because he drinks too much, but because, having lost said limbs in an explosion, he now wheels round town wasting cops and fellow crims alike from a motorised and heavily tooled-up wheelchair. Just try nicking this bad boy’s disabled parking space and see what happens! 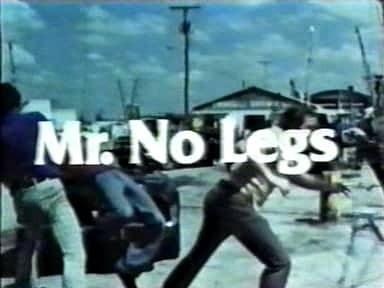 No Legs (played by real-life amputee Ron Slinker) is the main enforcer for suave crime boss Hart Bochner, an equal opportunity employer who’s making a fortune smuggling cocaine capsules inside Cuban cigars. 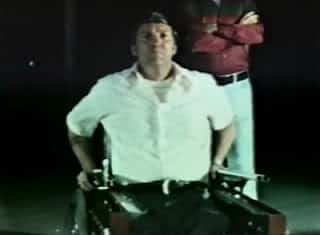 Like many wheelchair-bound folk, No Legs is fed up with being pushed around, and he determines to bump Bochner off and take over his narcotics empire. But Bochner is also getting worried about No Legs’ cold-blooded methods and so he orders a bunch of his heavies to dispose of the threat. Director Ricou Browning is best known for having played the Creature From The Black Lagoon in the 1953 classic, and here he stages the action scenes – including a bar fight involving midgets and trannies – as if they were taking place underwater. 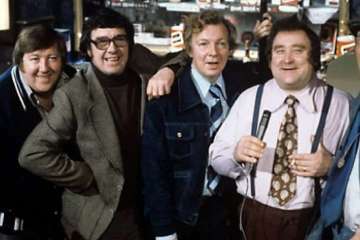 There’s a car chase at the end that goes on so long you could pop down the shops for some groceries and it would still be playing when you get back. 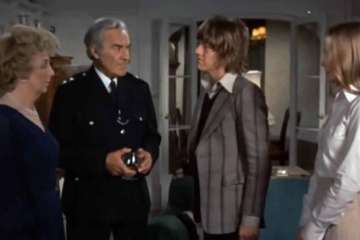 It’s bad movie gold, full of dodgy 70s fashions and horrible song interludes from a gruesome easy-listening duo called Mercy (who wouldn’t have appeared at all if they’d lived up to their name). There’s some cool dialogue though; spotting a black guy in mile-high platforms with matching earrings, Jaeckel comments, “He could be a pusher…” to which his partner wryly replies, “He’s a pusher all right, but what he’s pushing you stroke, you don’t smoke!” Right on, brother. Of course the real drawing card is No Legs himself, whose big moment comes when he’s set upon by six hard nuts while relaxing by a swimming pool with his well-stacked moll. Things just don’t get any better for aficionados of legless martial arts as he disposes of his small army of attackers, using the throwing stars attached to his wheel hubs and some nifty limbless judo to batter one guy into submission with his stumps! It’s a shame after all this that he gets bumped off so easily at the end, but when you hear “million-selling pop group” Mercy’s brain-rotting song over the end titles, you’ll realise he was wise to make an early exit! Just an FYI. 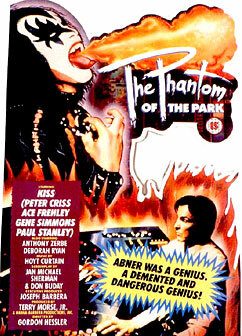 Ron Slinker is not the guy in the wheel chair. Ron Slinker is the guy getting choked by the belt in the above trailer at the 54 second mark. Finneaus is correct. 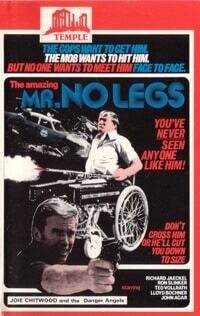 No Legs was played by Ted Vollrath who became a karate Grand Master despite the loss of his legs.